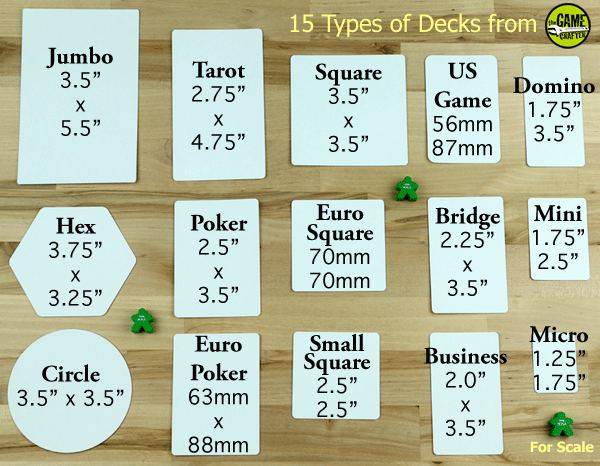 The Game Crafter can make 15 different sizes of cards. All cards are die-cut, have rounded corners, and are printed in full color on both sides. All cards are printed on 12" x 18" sheets of 305gsm / 165 Lb black-core card stock (as is used in popular trading card games like Magic: The Gathering), and this gives them a nice texture and good heft. Decks of cards can be any size and they are printed at our facility in Madison, Wisconsin. Horizontal Cards: If you intend to use your cards horizontally and wish for both sides of the card to be oriented in the same direction in print, you will need to rotate either the front or the back image by 180 degrees. Generally, the easiest way to do this is to rotate the deck back image (if using one). This step is not intended to be used if you are using your cards vertically.